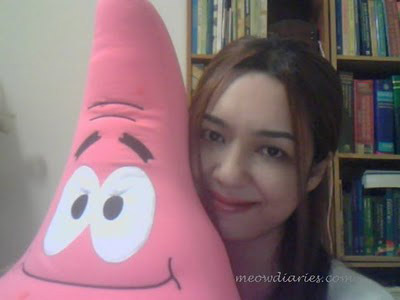 Today B brought home a pink fluffy surprise for me ... Patrick Star from SpongeBob World! Remember the huge SpongeBob in B's office? Well, now I have his buddy Patrick with me. It is a plush soft beanie and it is huge! Thanks so much Love, I adore Patrick and I can't wait to hug him tonight! Phoebe was of course curious and happily greeted her new friend. She even took the time to pose for a picture and they both look adorable together don't they? Happy Fluffy Friday! hahaha.. Pheebs looks the toy next Patrick.. lol! hahhahah.. yihaa.. no panda eye.. lol! Very pink, very big...scratching post???.....!! i agree, they indeed look adorable together! :* :* LJ Meow 1! =-O =-O =-O =-O =-O Elai!